Today is the 25th anniversary of the departure of Shah Mohammed Reza Pahlavi from Iran. Iranians throughout the country joyously celebrated his departure at the time. But RFE/RL reports that many Iranians of all classes tend 25 years later to remember the shah's reign with nostalgia. Prague, 16 January 2004 (RFE/RL) -- Mohammad Reza Shah Pahlavi reigned as the last shah of Iran for almost four decades. But in 1979, the Shah left Iran and never returned. He died of cancer on 27 July 1980 in Cairo. Veteran Iranian journalist Massoud Behnoud says that the shah's departure from Iran ended an era. 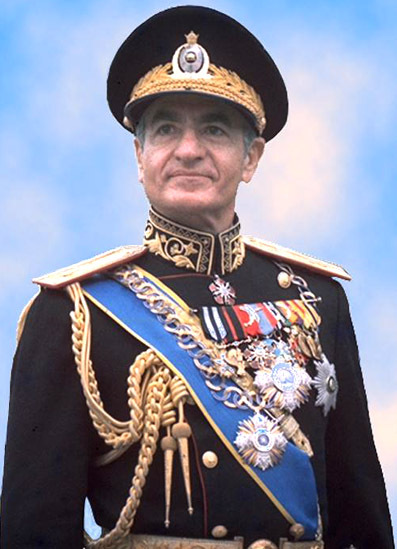 "On that day, I mean as soon as the shah's plane left Tehran airport around 12:30, I believe that in that moment the Pahlavi dynasty and also Iran's era of monarchy ended, even though [the people] had to wait 38 days till it was officially announced," Behnoud said. Two weeks after the departure of the shah, on 1 February 1979, Iran's main religious leader, Ayatollah Ruhollah Khomeini, returned to Iran after 14 years of exile and took power. On 1 April, after a referendum, he declared Iran an Islamic Republic. "We learned from 1979 that there can always be something worse." Behnoud says that at the time, a quarter of century ago, most Iranians took the departure of the shah as a positive development. "Twenty-five years ago on the day when the shah, the last king of the country, left Iran, only a small number of people thought about the fact that 2500 years of monarchy or more were ending. People focused on the reality that a dictator was leaving the scene," Behnoud said. The shah left Iran after several months of riots and violent protests, orchestrated by Khomeini, against his regime. Massoud Behnoud was there, and witnessed the celebrations in Tehran that greeted the news that the shah was gone. "As the radio carried the news, and with the early publishing of 'Ettelaat' newspaper with its big 'Shah Has Left' headline, all of a sudden the city exploded. In the queues in front of the gas stations, where people had gathered for gasoline and fuel -- it was winter -- people started to cheer and celebrate. And I had never seen either before that or after it -- in the last 40 years -- such joy," Behnoud said. Twenty-five years later, however, that joy has faded for most Iranians. Dissatisfaction is growing with theocratic rule. Many who despised the shah, and feared Savak, his secret police, remember his rule with nostalgia. Afshin Molavi, journalist and author of "The Persian Pilgrimages: Journey Across Iran," says that economic hardship and lack of social freedom are main causes. "When you travel across Iran what you notice is that there is a substantial amount of economic nostalgia for the Shah's era. And you see that just about everywhere you go and among all classes from the working classes to the middle classes, the upper middle classes, and you know there is a reason for that. Since the days of the revolution, Iranians earn in real terms one-fourth of what they did before 1979. And everywhere you go people complain about the lack of jobs. They also complain about the low wages, which they say do not correspond to the high cost of living," Molavi said. Molavi adds that the devaluation of the Iranian currency is another reason for nostalgia. He said the toman's sharp fall often is used as an indication of the Islamic Republic's mismanagement. Most of Iran's population had not been born when an Islamic state replaced the monarchy. Molavi says that young people's discontent is more likely to be with the strict social regulations imposed under the Islamic regime. Journalist Behnoud says that many people regret the departure of Mohammad Reza Shah. But author Molavi says few Iranians would want a return to monarchy. "They've come to this sort of a unifying idea that the Islamic Republic has not served us well, so what we need is a more democratic republic, and I think that the people don't necessarily believe that a monarchy is an answer to all of their ills," Molavi said. "New York Times" correspondent Stephen Kinzer is the author of "All the Shah's Men: An American Coup and the Roots of Middle East Terror." He tells RFE/RL correspondent Jeremy Bransten that those who know their history will understand why the shah had to go. "The root of the shah's problem is that he was never able to establish his legitimacy as a nationalistic, patriotic leader of Iran. And the reason he wasn't able to do that goes back to how he came into power. In the early 1950s, Iran was under a democratic government and had a fairly popular elected leader, Mohammad Mossadegh. But Mossadegh ran afoul of the British and Americans for his desire to nationalize the Iranian oil industry. As a result, the CIA and the British secret service collaborated to overthrow him," Kinzer said. Kinzer said the shah remained tainted as a tool of foreigners. "They brought the shah, who had fled the country, back to Iran and placed him on the Peacock Throne. As a result, he was seen by most Iranians, first of all as a tool of outside powers and secondly, as the person who frustrated nationalist and democratic aspirations in Iran. He was never able to escape from that shadow," Kinzer said. Kinzer says that when he asks people in Iran why they don't rise up against the present government, they reply that as bad as things might be, "We learned from 1979 that there can always be something worse." Golnaz Esfandiari is a broadcaster with Radio Farda currently working in the News and Current Affairs Department as a correspondent. Born in Tehran, she has a master's degree in clinical psychology from Prague's Charles University. She joined RFE/RL in 1998. As a broadcaster she has focused on human rights, women's issues, and the environment. Esfandiari is fluent in English, French, Czech, and Persian.